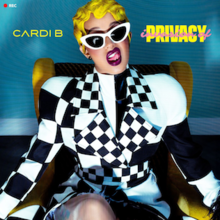 2017’s breakout star Cardi B finally releases her debut studio album, and while it certainly isn’t anything groundbreaking, she delivers 13 very solid tracks loaded with the hilarious personality we’ve come to love, a bevy of great guest spots and some surprisingly impressive technical skill. Invasion of Privacy is just about the best debut album I could have expected Cardi to make – she continuously defies her status as a meme or a one hit wonder. Cardi’s biggest strength – likely the reason she blew up as quickly as she did – is her unapologetic, honest personality and she is just what you expect on this project, being open about her rags-to-riches upbringing on opening track “Get Up 10” and being brutally honest about her feelings towards a certain member of the Migos. There’s something strangely empowering about hearing Cardi deliver lyrics that can be incredibly explicit, confident or carefree that most others wouldn’t dare. She builds herself up in the most hilarious ways, channelling the self-aggrandizing energy she injected into that iconic “Bodak Yellow” hook with tracks like “I Do”, featuring a celebratory SZA speaking on the pair’s many successes, and “Money Bag”. Even though the latter is all but a carbon copy of Cardi’s biggest hit, her lyrics still make it incredibly fun – her abrasive New York accent puts an extra, percussive, vitriolic punch onto every one of her boasts. The album does actually contain some sonic diversity as well. “I Like It”, a Latin trap banger, is the most fun song here and features the two biggest artists in the genre in J Balvin and Bad Bunny. The interpolation of the Pete Rodriguez classic track on the sample with such an aggressive trap beat was creative enough to make it an instant hit. “Ring” and “Thru Your Phone” see the instrumental take calmer, more R&B direction, but the fire doesn’t leave Cardi’s voice as she speaks about her partner’s infidelity. Kehlani’s hook on “Ring” is absolutely beautiful, and Cardi’s delivery makes her sound believably deeply hurt. We are getting Cardi with no filter across this project. For all the people writing Cardi off as a joke act due to her ridiculous persona, her technical skill always impresses me. To hit every word of these faster tracks while pregnant in her Coachella performance solidified Cardi as someone who deserves all of the successes she has. She keeps up with Takeoff’s incredible verse on “Drip”, while the chorus of “Bartier Cardi” is an absolute tongue-twister of lyrics. To pull off the album as well as she did is something of a surprise since, well, one of the main reasons we love Cardi is her embrace of her flaws – polish isn’t her strong suit. There are a few tracks on here that could have been improved with a bit more work, but the idea is there. “Be Careful” is a track that certainly grew on me from my first listen, with a catchy Lauryn Hill interpolation, but Cardi’s flow leaves a bit to be desired. As well, Chance the Rapper’s characteristically adorably happy feature on “Best Life” doesn’t really fit at all – it’s the song with the least punch on the project, with more of a melodic and meandering instrumental that doesn’t really accommodate the assault on the mic from Cardi. There’s something inexplicably magical about the injection of confidence that Cardi’s music provides, even when I don’t come from anywhere close to the same walk of life as her. The success couldn’t be happening to someone more genuine, and Invasion of Privacy proves that. Rapidly rising Colombian star Kali Uchis recruits one of the most impressive lists of collaborators I’ve ever seen for her debut album Isolation, blending her voice suited for contemporary R&B with her own cultural elements of reggaetón and bossa nova. Although Uchis’ vocals are not always the strongest or most distinctive, Isolation is an album that is built through complex and dynamic instrumentals featuring numerous instruments and a full orchestral sound, Uchis’ pleasing and airy tone just a universal complement that allows her many star producers to easily build a great track of any genre around. Appearing across the album are Thundercat, DJ Dahi, Brockhampton’s Romil, Steve Lacy, Sounwave, Gorillaz, Tame Impala’s Kevin Parker, Greg Kurstin, BadBadNotGood and more. The albums’ opening two tracks introduce the listener into Uchis’ unique musical niche perfectly, the intro “Body Language” a calmer track with a samba bassline transitioning into “Miami”, the site where this traditional sound becomes modernized with some trap hi-hats complementing the reggaetón guitar chords. Uchis obliterates people’s misconceptions of her in the track, stating that despite her appearance she can be a powerful, dangerous figure capable of achieving her aims. Uchis’ team not only provide her with lush instrumentals, but some seriously catchy melodies as well. Steve Lacy’s hot streak continues with “Just A Stranger”, Uchis and Lacy himself layering their vocals to create an anthemic and rhythmically sound chorus over a fun funk instrumental. Uchis is at her best when she taps into her Colombian roots, singing in Spanish on “Nuestro Planeta” and breezes through upbeat, danceable Latin instrumentals on “Your Teeth In My Neck” and “Tyrant”. It’s great to hear such a modern take on a style that isn’t incredibly prominent in popular music, despite the recent explosion of Spanish music into the mainstream. The melodies here are strangely familiar, keeping in line with their reggaetón roots, yet at the same time they’re nowhere else to be found in 2018. Uchis’ greatest vocal showcase comes on the track “Flight 22”, a downtempo track that veers closer to bedroom pop with dreamy, twinkling keys and a string section backing up her impressive range. Her sensual vocal inflections remind me of Amy Winehouse, named as a large inspiration behind the track. More often, however, Uchis’ vocal tone is best utilized as the smooth, malleable aspect to fit over any style of instrumental. “Dead To Me” is the most chaotic track here, featuring cascading electronic blips and a high-speed breakbeat over the omnipresent funk bassline, Uchis’ calm tone making it seem as if she handles the complex musical world with ease – and she’s confident and assertive enough in her delivery that she doesn’t need to go all out to make her point. I always love albums that make the most out of their sequencing to tell a story, and the albums’ later interludes “Gotta Get Up” and “Coming Home” serve as transitional pieces, completing the gaps between the surrounding tracks and completing a full narrative. Gorillaz’ manic track “In My Dreams”, where Uchis runs through a whimsical dreamscape before waking up to negative realities, and the Tyler, The Creator-featuring single “After The Storm” shine in the latter half. The main takeaway from this album is Uchis’ incredible consistency. It’s not always this difficult to pick out a least favourite track. Her command of some seriously complex instrumentals seems effortless at all times, and we could be witnessing the start of something very exciting. A cappella success story Pentatonix returns to their roots of covering some of the most popular songs of the year after a switch in members saw them acquire a new bass vocalist. While it can get rather easy to grow tired of the group with their quantity over quality approach, many of their arrangements utilizing the same tricks despite their torrid release pace, it’s pretty impressive that they can breathe new life into something like a “Despacito” / “Shape of You” mashup. This kind of material is what made them famous in the first place, and there are still a few flashes of greatness here to remind us why. We open with Charlie Puth’s “Attention”, a track that was basically meant for a cappella from the beginning that showcases new bass Matt Sallee prominently early on. The extra syncopated melody that doesn’t exist in the original added to the 2nd verse is a great touch, and the half-time section and jazz chords that close the arrangement make for their most ambitious exploits across the whole project. The two mashups on this project are both highlights, showing that the group is at their best when at their most creative. It’s tough to make an album of covers of extremely played out songs and continue to hold interest. Their combination of “New Rules” with Aaliyah’s “Are You That Somebody” works shockingly well, and the first three notes, each vocal part building on the next, that hit in the breakdown get me every time. Kirstie Maldonado sounds fantastic singing in her more comfortable language on “Despacito x Shape Of You”, even switching a few lyrics in Sheeran’s hit to Spanish. Maldonado is the strong suit across the board, carrying a lead vocal of Julia Michaels’ “Issues” pretty flawlessly. Songs like “Issues” and Kesha’s “Praying” are pretty impossible to do badly regardless, and the group rise to the occasion covering these great tracks. Too often, the group doesn’t do much to alter the structure of the original song, thinking that the tricks that we’ve heard before will suffice. “Finesse” is basically a carbon copy of a song that was already pretty sparse instrumentally due to its new jack swing influence – more interesting vocal percussion acrobatics might have been interesting here, while their approach to Ed Sheeran’s “Perfect” adds in Kevin Olusola’s cello yet again, losing the spirit of a cappella as they structure in a huge, empowering build-up in the same way they’ve done in the past. The other thing that annoys me about Pentatonix studio albums recently is that they’ve stopped trying to hide how much of these finalized studio arrangements aren’t performed live, adding in layering and other computer-generated processes in post-production. “Stay”, a predominantly electronic song, features the same loop of Alessia Cara’s pitch-shifted vocal run that would be impossible for a human voice to replicate. It’s harder to tell for sure judging by Mitch Grassi’s shockingly high vocal, but I think I was able to distinguish Maldonado singing underneath her lead vocal as well. Pentatonix are obviously ridiculously talented, but I still think that their album of original music was their best work yet. The novelty of these A-list covers has worn off over time, and I want to hear what they are able to do without the constraints – the mashups here prove their creative ability.